Arthur Paul Boers describes himself as “Seminary professor, Author, Mennonite minister, Benedictine oblate.” I prefer to describe him as “deep man of God.” Arthur Boers taught one of my doctoral courses, a course on Christian spirituality. It was one of the finest and most life-changing courses I ever took. So anytime I can find a volume written by him, I pick it up and absorb it as soon as I can. The Way Is Made By Walking is Boers’ theological reflection on a pilgrimage he took along the Camino de Santiago in Spain. This five hundred mile journey, which he completed on foot in 31 days, had him meet people of all walks of life – and not all people of faith. Many were Roman Catholic pilgrims, some were Protestant, but others were of no particular faith persuasion at all. Boers found his journey enriched by all whom he met. The book was, to me, a helpful reminder that all of life is a journey, and that the destination is not everything there is to it. This has been a difficult thing for me to grasp, but over the last few years, God has taught me that the journey matters, and shouldn’t be forsaken in favour of getting to the destination more quickly. Don’t get me wrong: I look forward to spending eternity in the presence of God, by faith, and am not afraid of what I will face when I breathe my last. In fact, I am excited about standing before the throne of grace! But in the past, I have tended to focus so much on that destination that the journey – this life – played second-fiddle. I may never walk a five hundred mile pilgrimage. As much as I enjoy a good walk, I’m not sure I’m built for that kind of pilgrimage. But I am built, specifically, to fulfill the plans God has for me while I serve him in this life. And I want to live out those plans to the fullest measure. The Way has encouraged me to that end, and I recommend the book for all believers. Because of its narrative form, it reads fairly quickly, yet has a depth to it that speaks to the soul. This was not a book in which I highlighted or underlined. I just let the words speak. I read it to learn, but not in a ‘how-to’ kind of sense. And every practicioner of ministry needs a book like that, at least once in a while. 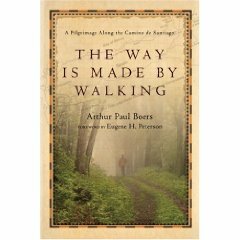 The Way Is Made By Walking is written by Arthur Paul Boers, and was published in 2007 by Inter-Varsity Press. ISBN 978-0-8308-3507-2.